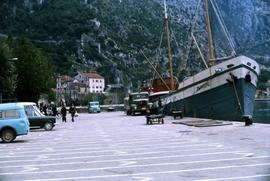 Colour Kodachrome 35mm slide depicts a car parking lot near a harbour with a ship docked. Photograph depicts a cargo of British cars from "Mostun".Bird's eye view of empty harness for hoisting cargo.This photograph is associated with Empire Stevedoring Co. Ltd. Photograph depicts a cargo of British cars from "Mostun".Bird's eye view of three stevedores holding empty harness for hoisting cargo.This photograph is associated with Empire Stevedoring Co. Ltd.